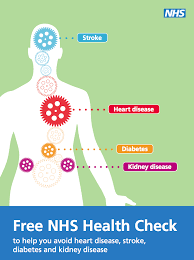 You will be offered a free NHS check at the practice, if eligible, to help prevent heart disease, strokes, diabetes and kidney disease. If you are between the ages of 40 and 74 and are not already being treated at the practice for heart or kidney disease, stroke, diabetes, hypertension, atrial fibrillation, transient ischaemic attack (TIA), high cholesterol or peripheral arterial disease, you will be eligible for a 30 minute health check with our Healthcare Assistant who has been specifically recruited to do this. help you change things in your life to make your health better in the future. How will we contact you if eligible? We are permitted by NHS England to offer healthcare checks to up to 20% of the eligible patients each year so invitations will be sent out on a phased basis.